I know it seems like all I’m making these days are rich treats! That’s kind of true, and my scale is starting to register that fact. So, today’s post gets the calorie-laden delicious summer-time treats out of the way for a little while. I’ll go back to fish and salads and more waist-line friendly foods soon, I promise. But, what’s a food blog if you can’t indulge a bit every once in a while? Preheat the oven to 325º F, and put on a kettle for the hot water bath. Combine cream, vanilla bean (yes, the whole thing) and lemon zest in a medium saucepan. Heat over med-high heat, stirring often, until it just starts to boil. Remove from heat, cover, and let it sit for 15 minutes to let the flavors infuse. Strain the cream into a large measuring cup (or other pour-able container), pressing as much liquid as you can out of the vanilla bean and lemon zest. In a medium bowl, whisk together the egg yolks and vanilla sugar* (What’s vanilla sugar? you ask. See the note) until frothy and pale yellow. Slowly pour the cream into the egg and sugar, whisking continually. What you’re doing here is making sure the egg yolks don’t scramble, so GO SLOWLY especially at first to temper them. Once you’ve brought the yolks up to temp. a bit you can pour in the cream more quickly, but keep whisking! Pour the mixture into four ramekins, place the ramekins in a cake pan, and pour hot water into the pan until it comes halfway up the sides of the ramekins. You’re making a water bath which regulates the cooking temperature of the custards, cooking them more evenly and giving you that lovely creamy texture that you want. Carefully transfer the pan to the oven and cook for 45-60 minutes. (Times will vary depending on what size and shape ramekins you have. Mine took 52 minutes.) The custards should be set but still trembling in the center. Take the ramekins out of the pan, and refrigerate for at least two hours, but up to two days. 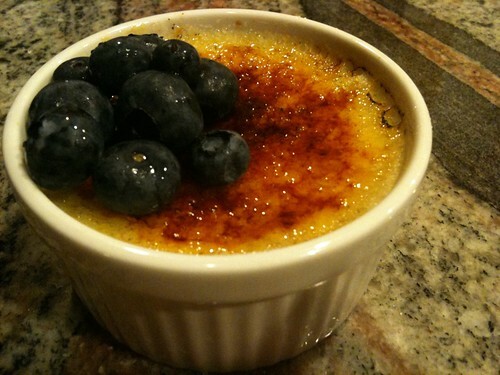 Half an hour before you plan to serve them, take the creme (not yet) brulee out of the fridge. Just before serving, sprinkle vanilla sugar evenly over the top of each custard and then get your torch ready. With the torch, carefully melt the sugar on top of each until brown and bubbling. Let it cool and harden before garnishing with fresh berries and serving. *Vanilla Sugar. This couldn’t be easier to make if you have three items on hand: granulated sugar, a vanilla bean, and an airtight container. Simply put the sugar and vanilla bean into your container and seal it up. In a few days you’ll have vanilla sugar! Simple, right? I like it so much (because what sweet thing isn’t better with vanilla?) that my main sugar bowl is a vanilla sugar bowl. I use it for my coffee and for any recipe that calls for less than about a cup of sugar. It’s a wonderful thing to have around, and I highly suggest that you keep a container around in your pantry. This entry was posted in Sweets and tagged cream, eggs, lemon, sugar, vanilla. Bookmark the permalink. OMG what did you do with those and why wasn’t I there?